This charming accommodation is ideally situated in the heart of Brittany. In 2015 it was fully modernised and equipped with amenities such as WiFi, a dishwasher and an en suite bathroom. You have a private terrace but can also use the garden (800 m2) and the wellness area. The wellness area has a covered jacuzzi, an outdoor shower and comfortable sun loungers. Towels are included. The dishwasher tablets, washing products, a bottle of Cider and made-up beds are all signs of the friendly proprietors' hospitality. They do absolutely everything to provide you with a comfortable stay. You are just 30 km from the beaches at Loquirec and the pink granite coast for which Brittany is so beloved. The inland region has exceptionally beautiful forests that are great for hiking and cycling. It is quite common to encounter deer, birds of prey and otters. The granite sculptures in the Valley are worth a visit as well. A daytrip with a regional guide will let you discover the best fishing spots for salmon or wild trout. Golf, bicycle rental, tennis, museums and restaurants with regional produce. 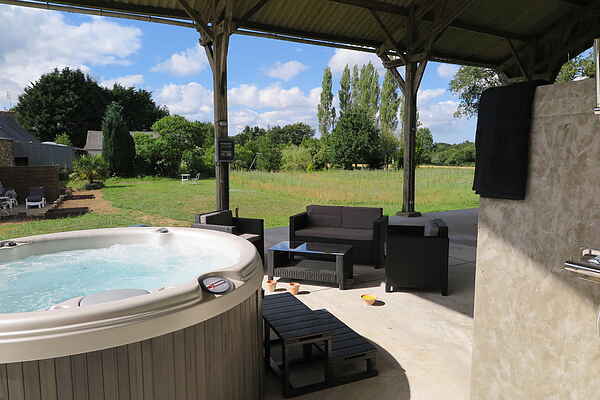 The outdoor grounds with a wellness area are shared with another Gîte, which also accommodates a maximum of 2 people.